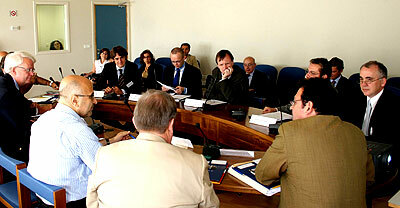 The topic of the seminar is unusual, but the idea emerged from the realisation, in an encounter with distinguished Icelandic colleagues in Vienna last year, of how little both the people of Iceland and Lebanon knew about each other, at a time when they find themselves on the diametrically opposed sides of the EU and much affected by its emergence. So the first objective of the conference is to allow Lebanese to meet colleagues "at the antipodes", hear about Iceland and benefit from the experience of a remarkably civil country and people. Discovering the contrasts between our two societies would probably be most beneficial, but we also think that there is a commonalty deriving from the need for small populations and territories to adapt to the emergence of a huge and unprecedented construction which is the EU. HH Judge Prof David Thor Björgvinsson and Prof. Chibli Mallat will chair the discussions. The presentations and discussions will take place in English and French. The first half day will include a general and mutual discovery of each other's country and society. 1. Iceland presented from Iceland : Iceland in global affairs, or what features determine the size of states? The second half day will focus on the legal-political structures within each country, with a special attention given to the protection of democracy and the transparency and dynamism of the economy. 5. Rule of law and the economy in Iceland : experience and constraints. 8. Iceland and the EU: Why is Iceland not a member ? Professor René Chamussy, s.j. 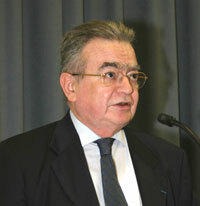 is Rector of Saint-Joseph's University, sociologist and historian. Dr. Baldur Thorhallsson, associate professor of Political Science, University of Iceland, Faculty of Social Science. Expert of the role of small states in the international community, and of the position of Iceland in relation to the Union and European integration. Elias Khouri is an internationally renowned novelist, and lives between Beirut , where he edits the prestigious weekly supplement of the daily al-Nahar , and New York , where he is Professor at NYU. Prof. Roland Tomb, Faculty of Medicine, USJ, heads its dermatology service. A specialist of ancient Levantine languages and theology, he has been preparing a book introducing Lebanon to the educated reader. Professor Dr. Gudmundur Hálfdanarson, University of Iceland , Faculty of Arts. Expert on Iceland 's struggle for independence and in particular the role of and the idea of sovereignty in that respect and the development of that idea and its significance in relation to the European integration. Dr Prof Olafur Isleifsson teaches at Reykjavik University , School of Business . .
Dr Georges Saad teaches at the Faculty of law, Lebanese University . He established and presides over the Lebanese Association for the Philosophy of Law. HE Ambassador Svein Sevje, ambassador of the Kingdom of Norway to Lebanon and Syria . Roger Melki is a partner art Etudes et Consultations Economiques-ECE, Beirut , and teaches at the Strategic Studies Centre at USJ. 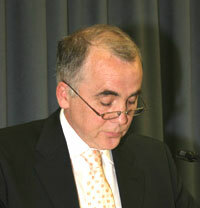 Sadeq Jalal al-Azm is Emeritus Professor, Damascus U. , presently professor at Princeton . Chibli Mallat is principal, Mallat law offices, and EU Jean Monnet Professor in law, USJ, and director of the Centre of the Study of the European Union, USJ. Convenor and Co-chair of conference.